Most commercial and industrial premises are nowadays required to have a fire safety alarm installed to BS 5839. The main functions are to detect the fire and secondly to sound an alarm in all parts of the building. The system may, in its simplest form, be operated by "break glass" points (a manual system). More complex systems may have smoke, heat and other detectors fitted. The system required will depend on use of building, number of employees / public usually present and if it is used for accommodation etc. 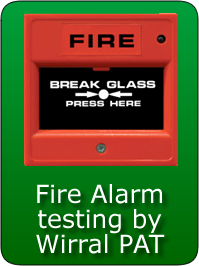 The fire safety alarm system should be checked daily and tested weekly by an appointed member of staff. 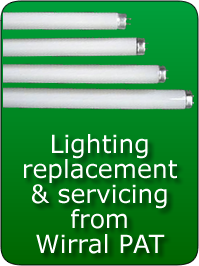 Further more in depth periodic inspections are required at 3, 6 and 12 monthly intervals. These are to be conducted by a qualified engineer and recorded in a log book. Wirral PAT Ltd. have fully qualified fire safety alarm test engineers who can conduct these periodic inspections of your Fire Alarm system and the testing of the various fire detection sensors etc. 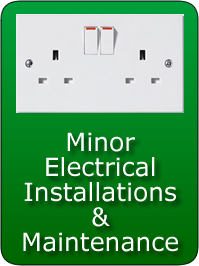 Contact us today for a competitive quote and to discuss our annual fire safety alarm testing contracts. 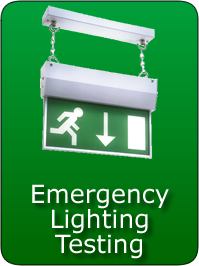 You may also be interested in our emergency lighting testing.